This ambitious experimental retrofit of a Victorian barn high in the hills of West Yorkshire has turned a cavernous, draughty space into a comfortable low energy period home — and cut its heating bills by over 80%. The late poet Ted Hughes grew up in West Yorkshire, and wrote vividly about the area’s animal life – and its weather. Winter in the Pennines can be pretty remorseless, so this Victorian barn, perched 300 metres up on an exposed West Yorkshire hillside, was not the easiest building to make into a cosy, low energy home. The first builders who tried failed dismally. A bog-standard conversion in the early 1990s had left the barn’s original solid walls (faced with dressed stone but with a rubble core) uninsulated and draughty. There was a cavity-walled extension whose nod to insulation was a cursory 30mm backing of polystyrene in the cavity, on the blocks forming the inner leaf. Roof insulation was minimal, and the house was draughty and sieve-like (with very poor airtightness of 16.9 m3/m2 hr at 50 Pascals). 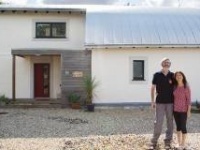 Owners Sue and Paul moved to the barn, near Cumberworth, about 17 years ago, and they love the location with its isolation and its views – but they have known for a long time that something would have to be done about its energy performance. Sue and Paul were fortunate enough to have the capital resources to undertake the drastic improvements required. But they faced another common obstacle which holds even able-to-pay building owners back from undertaking deep retrofit: they needed to find a builder they could trust to get it right. Green Building Store also solved a longstanding water penetration issue, by diagnosing two missing cavity trays. “They actually thought about what the problem was, the previous builders just slapped on a bit more flashing and went away,” Sue says. 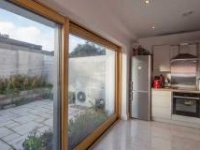 The first priority of the retrofit was comfort: insulation and airtightness would be key. Putting a lid on rising bills was also crucial, and the clients also wanted to reduce dependence on fossil fuels and cut their carbon footprint: first by saving energy, and second, by generating as much as possible of their remaining energy needs on site. Although the house was superficially in good order and structurally sound, attempts to tackle ongoing issues with the plumbing had left numerous holes in the walls and ceilings. The layout upstairs was very poor, with two separate staircases, and one room only accessible by crawling in on hands and knees, so a full retrofit offered the chance to completely remodel the top of the house. The boiler was on its last legs, offering the opportunity to switch away from LPG and install a ground source heat pump powering underfloor heating, which would entail digging up the solid floor. Lastly, the house had a cesspit — very expensive as water ingress meant it needed frequent emptying, so Sue and Paul decided to replace it with onsite wastewater treatment. Although they had initially hoped the retrofit could be carried out in two stages, while they remained in situ, it soon became clear that it would be a great deal easier if they gave Green Building Store a clear run at the house, so they moved out to a small rented cottage nearby. As a traditional stone building, the house was unsuitable for external insulation – the planners would not have been happy – so a safe internal insulation solution was required. Overall, although of course the ultimate aim of the retrofit was to save energy, the design team had to prioritise condensation risk, as there is no point in having a lovely warm house that is going mouldy. Solid walls pose a particular problem with internal insulation. The insulation makes the masonry colder, and potentially slows the drying out of trapped moisture in the wall. These risks are reduced if the insulation value is not too great, and if the system is vapouropen and capillary active, so that moisture can escape from the wall inwards as well as outwards. Potential moisture risks here were several, including driving rain penetrating the exposed west walls, damp from groundwater soaking inwards and upwards (the solid walls had no damp proof course, and with the rubble interior, retrofitting one was impossible), and interstitial condensation from internal moisture. For the solid walls here, Green Building Store decided to trial an insulation system called TecTem (which is not currently sold in the UK) based on perlite insulating blocks, which are made from volcanic glass. TecTem was chosen as it is capillary active and vapour open, but biologically inert and quite alkali, therefore relatively mould-resistant (more so than wood-fibre). “We were very pleased to find the product as water penetration was such an issue here, with the stone and the location,” Butcher says. 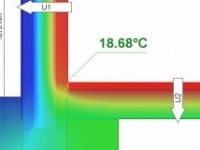 Nevertheless, Green Building Store wanted to be as sure as they could that the system would perform properly, so they had dynamic moisture simulations carried out using Wufi software to predict the way the insulated walls would behave over time. To give enough accuracy, the stone in the walls was tested for moisture permeability using Karsten tubes. The extension walls were not such a moisture risk, as the outer stone leaf effectively forms a ventilated rain screen, so a cheaper internal insulation build-up with insulated studs supporting vapour-open mineral fibre behind an intelligent membrane was used. The Wufi modelling predicted that the chosen systems would be safe. The team were also pleased to learn that the extension walls were predicted to remain sufficiently dry enough even with the gypsum plaster retained behind the insulation (gypsum has a higher mould risk relative to lime) – so it did not have to be hacked off and replaced. Before applying the internal insulation to the old, solid walled section, the floor joists were moved away from the external wall and the walls were parged to help minimise wind-driven moisture and provide a smooth surface. Water inhibitor was added to the bottom 900mm of the walls to inhibit rising damp. The east wall is particularly damp at the bottom, so Foamglas slabs were used as an impervious tanking and insulating solution here. TecTem was quite tricky to use, Bill Butcher reports, because it is relatively soft and friable, though this makes it easy to cut to size when required. It is supplied with its own installation system — pretty similar to those used for external insulation, including a levelling coat, adhesive, filler, a textile mesh layer and finishing plaster/render. The uneven surface of the Victorian stone meant a lot of levelling was required, entailing several re-orders. Because TecTem was an unfamiliar product that was being used in a relatively risky location, Green Building Store jumped at the chance to participate in a research project to monitor the walls post-retrofit. In partnership with Simmonds Mills Architects, 54 moisture and temperature sensors were installed around the house, throughout the thicknesses of the walls, and at the joist ends. So far the monitoring results indicate the walls are performing well, with moisture levels slowly reducing, as the insulation reduces the moisture condensing on and soaking into the wall from the inside, while allowing the existing moisture to slowly dry out, with the help of the ventilation system. Insulating the reveals is critical to the performance of solid wall insulation: uninsulated reveals in walls treated with internal insulation represent a significant thermal bridge and even worse, pose a major threat of condensation and mould. The window openings at the Cumberworth barn were relatively small and furthermore, Green Building Store triple-glazed windows had already been installed, so a very thin insulation was required for reveals. The team splashed out on vacuum insulated panels (VIPs), as the insulation value of a thin enough sliver of standard insulation would have been too poor. VIPs were also used against the external wall behind the stair string, so that the stairs did not have to be rebuilt. VIPs are not without their problems — and not just with the price. They are highly vulnerable – if they are cracked, or punctured by a nail or screw, air will rush in and the insulation value will be much reduced. While the current occupants know that they can’t, say, hang blinds in the window openings, there is always the concern that this message might not be grasped by future occupants. As much insulation was fitted into the roof — up to 350mm -- as the limited headroom would allow, between and below the timbers. Meanwhile the ground floor was excavated to 450mm in order to include a concrete subfloor, 200mm of insulation, and an underfloor heating slab. Thermal bridging was avoided by surrounding the heated slab with an insulation upstand to meet the wall insulation – which in turn meets the roof insulation. There was also a thermal bridge where the old gable end wall, now an internal partition wall, cut across the internal insulation to join the external wall. The impact of this thermal bridge was reduced by continuing the internal wall insulation around the corner and about 400mm inwards, along both sides of this partition wall. In such a windy location, airtightness was crucial to comfort and performance. The airtightness layer for the solid walls was the internal parge, with all penetrations and joints taped. For the cavity wall, airtightness was provided by an Intello Plus membrane inside the mineral fibre insulation (Intello Plus was also used in the roof), and on the whole this strategy was very successful. However, air testing after the retrofit was complete showed the building had two major leakage points. One was the wood-burning stove, which despite being a specially procured ‘passive’ model, leaked around one air-change-per-hour (at 50 Pascals) all on its own. Replacing it with a modified Morso S11 stove largely resolved this issue. The second issue was more frustrating: thermal imaging during air testing showed ingress of cold air through the stone fabric of the solid internal parition wall (at the gable end of the original barn), via the exterior masonry. Outside air was entering the outside walls, passing sideways through the rubbly masonry and entering the room. “Given that the rest of the building — except the stove, which we accounted for separately — was so carefully done and showed no detectable leaks at air test, we were pretty sure that this one partition wall actually accounted for around one extra air-change-per-hour loss of airtightness,” Bill Butcher says, and he is frustrated that the team did not anticipate the problem. “In hindsight we realise we should have wet plastered the wall and taped the joist ends into the parge, or cut them and hung them from the wall,” he says. Green Building Store has now invested in their own air blower to spot anything like this at an earlier stage. Sue had long been attracted to the idea of using a heat pump to capture heat from the environment and cut fossil fuel use. “We have a large field below the house that is very boggy and never freezes, making it an ideal heat source for a ground source heat pump – and being off the gas grid made the decision to switch easier,” she says. The team also managed to squeeze in an MVHR (mechanical ventilation with heat recovery) system, essential in order to maintain air quality and retain heat, and fitted both PV and solar thermal panels onto the not-especially-large roof. “The roofs face east and west, so we have generation all day, from 4am to 10pm in the summer,” Sue says. (above, from left) Shown here is the Solitex Plus windtightness membrane which was fitted under the roof slates, and insulated flashing around a Velux roof window; further airtightness detailing in the roof, with Pro Clima tapes around roof timbers; parging around joist ends for airtightness. The performance has come in pretty close to the design target: modelling in the passive house design software PHPP suggested a space heat demand of 65 kWh/m2/yr. Extrapolating back down to 20C (the PHPP design temperature) from the actual monitored fuel use at 22C, and subtracting the assumed energy consumption by appliances and hot water, suggests the space heat demand at 20C is around 69kWh/m2/yr, just slightly higher than the PHPP estimate. While it isn’t really possible to know what the average temperature or true space heating demand of the building was prior to the retrofit, looking at old gas bills and assuming the whole house was heated to 18C all the time – though in reality it was likely far lower – and that no wood fuel was used, the fabric heat demand works out at around 200kWh/ m2/yr. As wood was used as well, and parts of the house were unheated — or unheatable — the original fabric energy demand could easily have been double that or more, the team at Green Building Store suspect. Even if it had been possible to heat the house just to 20C, it would have cost anything between £500 to £1000 extra per year, or even more, to do so. Though with so many draughts, it might not have been much more comfortable. By contrast, post retrofit, turning up the thermostat from 20C to 22C is probably only costing Sue and Paul an extra £50 or so a year. So why wouldn’t they? While deep retrofits such as this will be essential if we are to meet our ever-morepressing carbon emissions targets, climate change is often a secondary driver for building occupants. Although Paul and Sue were indeed keen to cut their carbon footprint, first and foremost they wanted to be comfortable. And that they have certainly achieved. When do you need to do Wufi condensation analysis on a building? The answer is – probably more often you think. While many designers are starting to question previous practice, the official guidance, which has been inadequate for a long time, is still trying to catch up. Last summer, an important caveat was added to BS 5250, the British Standard for control of condensation in buildings, on which much else, including aspects of product certification, is built. 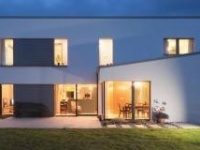 The standard is also referenced in Part C of the Irish building regulations, which deals with resistance to moisture. New tables have been introduced which hopefully clarify the recommended assessment methods (ie either linear or dynamic) for different types of floors, walls and roofs. BSI says it has taken the “knowledge of the problems caused by moisture in buildings [which] has advanced rapidly since BS 5250 was last revised in 2011,” into account in their update of PAS 2030 – the certification standard required of installers, should they find themselves in receipt of ECO funding to install solid wall insulation. The standard now says a great deal more about moisture risk and also the need for ventilation than the previous version. However ,it is not yet clear if enforcement will be stepped up to match. Pending the full reviews of BS 5250 and Part C of the building regulations in England (which again deals with moisture protection, and is currently under review separately), designers should beware using solid wall insulation techniques without condensation analysis, even where these have been deemed perfectly acceptable even in the recent past. Things have gone badly wrong in some instances, and designers, suppliers and installers have all been caught out. Some insulation suppliers will give detailed advice on the suitability of their system for a particular setting, and some even perform Wufi simulations for their customers. However, Wufi modelling is not a get out of jail free card: in particular, the reliability of the results depends critically on the accuracy of the fabric properties fed into the calculations. So — especially when a wall seems to be in poor condition, damp, porous or even just unusually thin, it is probably as well to get some sums done first — rather than be sorry later. Before: Victorian barn with inner and outer stone facing, filled with rubble and the occasional through stone. Original wall U-value: 1.11 W/m2K. Before: 1990s cavity wall construction with 30mm poly-back insulation (not continuous). Original Wall U-value: 0.992 W/m2K. Before: Roof slates, minimal 100mm insulation. U-value: 0.487 W/m2K. Windows & doors: New Green Building Store triple glazed FSC-certified timber windows and doors. Overall U-value of 0.90 W/m2K — installed a few years prior to full retrofit. 10mm of Kevothermal VIP insulation (lamda value 0.007) was added to window reveals during the retrofit to minimise thermal bridging. Before: LPG gas heating and solid fuel fire After: Ground source heat pump system feeding into underfloor heating on ground floor and panel radiators in the top two floors. Ground source heat pump: Kensa high temperature single compressor H062-S1H, with a nominal output of 6kW at a ground temperature of 0C and a heating flow temperature of 3C. At these operating temperatures it has an efficiency of 417% (COP of 4.17). This model is able to reach an output temperature of 65C which allows it to heat the hot water cylinder without the need for an immersion heater although one was provided as a backup. COP at 65C output is 2.08. Plus Morso S11 wood burning stove and 3.9 sqm solar flat plate array supplying domestic hot water. Electricity: 7 x BP 4175 mono crystalline solar PV modules. System size: 1.225kWp. After: Paul Novus 300 heat recovery ventilation system — Passive House Institute certified to have heat recovery rate of 93%.